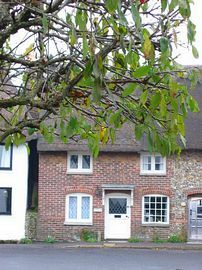 Four the Square, Prinsted is a charming Grade II listed thatched cottage within a conservation area in the centre of a largely undiscovered hamlet on the shores of Chichester Harbour. The hamlet of Prinsted includes a number of period and character properties. It is very tranquil, unspoilt and photogenic throughout all seasons of the year. Visitors are able to walk from the door to the foreshore within a few minutes Here one can linger and admire views of the harbour or walk around Thorney Island to Emsworth or around the Chidham peninsular to Bosham. 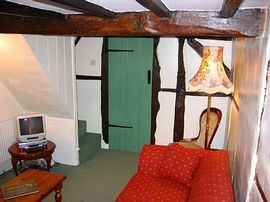 This 18th century cottage has many original features including thatched roof, exposed beams and wattle and daub walls. However, it has the benefit of all modern conveniences including full central heating. The cottage sleeps four people in two bedrooms. The accommodation comprises: on the ground floor, a comfortable lounge with two double seater settees, kitchen/dining room and a shower room with WC. On the first floor there is a bedroom with a double bed and a second bedroom with twin beds. 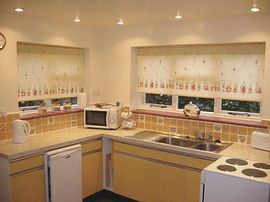 Equipment includes colour TV with Freeview, a DVD player, CD/tape/radio player, fitted kitchen with microwave, fridge with freezer compartment and electric cooker. There is also a hairdryer in the bedroom. 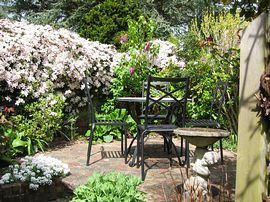 At the rear of the property there is a pretty courtyard garden with table and chairs. 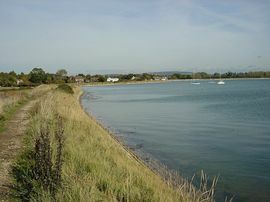 Chichester Harbour is renowned for sailing and other watersports. Many excellent golf courses are within easy reach. Sports centres with swimming pools are to be found in Havant and Chichester. Goodwood racecourse and the Goodwood motor racing circuit are both close by - the latter now extremely popular for the annual Festival of Speed and Revival events. Emsworth, a picturesque harbourside village is a mile away and has many shops, restaurants, several takeaways and numerous pubs. The Travellers Joy pub in Southbourne serving good food using local produce is within walking distance, as are village shops and bus and rail services. There are many local places of interest including the cathedral city of Chichester, the Roman Palace at Fishbourne, the Weald and Downland Open-air Museum, Arundel with its castle, cathedral and Wildfowl Trust and Portsmouth with its historic ships and naval dockyard are all within easy reach. 17th century thatched cottage with many original features. Within walking distance of the harbour foreshore. All bedding and linen provided in price but please bring towels. Local Services: Buses and Southbourne train station within easy walking distance. Also local shops, doctor and dentist and public phone box. Reach the A259 from the A27 and follow the signs to Southbourne. Take the turning signposted Prinsted and follow the lane down to the square. The cottage is on the north side of the square in the centre. £400.00: Jan, Feb, March, April, Nov, Dec (except Christmas & New Year). £450.00: Part of April, May, June, part of July, Sept, Oct.
£490.00: Part of July, August, Christmas & New Year. The cottage is available all year round. "A lovely cottage, we felt welcome the moment we walked in." "The little garden is so lovely, ideal for a sunny breakfast." "Beautiful walks around the coast." "Holidays are always too short in such a beautiful place." "Our third visit to 4 The Square."